Omega-Lite panels offer a highly decorative, strong, and durable surface finish for exterior wall surfaces. 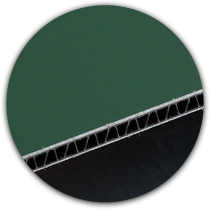 Composed of a polypropylene, corrugated core between two finished aluminum sheets, these panels are non-absorbent, water-resistant, and easy to maintain. Maintain a class A fire rating and NFPA (National Fire Protection Association) 285 approved for several of our installation methods. Laminators offers unparalleled flexibility with multiple installation systems to fit your project and regional conditions. The type of installation system can make a dramatic difference in the appearance of your application. We offer many choices to consider when deciding on the look of your next project.